This is a screen shot where I was dragging some baits at 35 feet with some isolated Stripers nearby then came into a major school of Herring. The vertical stack in the upper water column just before the Herring are white perch. 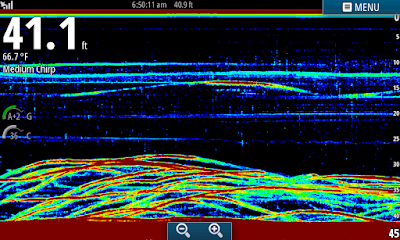 Here I am using Chirp and looking at a few downlines going through non aggressive Stripers. We are banging um in this busy screen. This is a good example of locating Stripers. 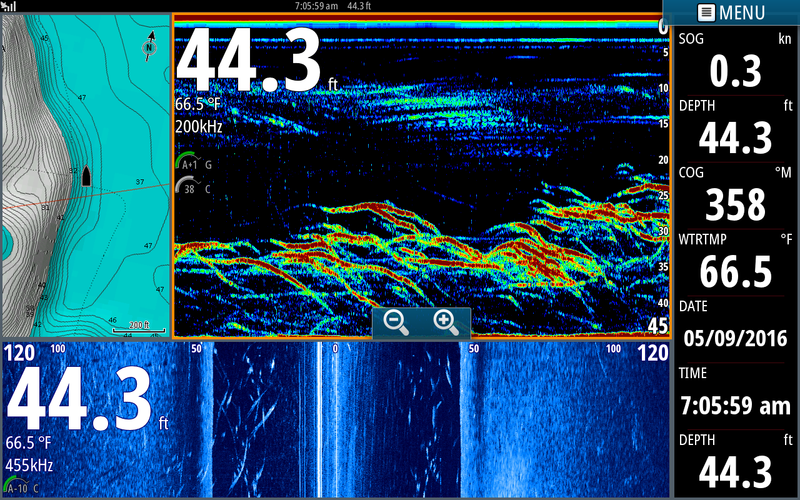 I was running 25mph on the left half of the screen when I noticed Stripers from 25 to 40 feet deep in the middle of the screen. 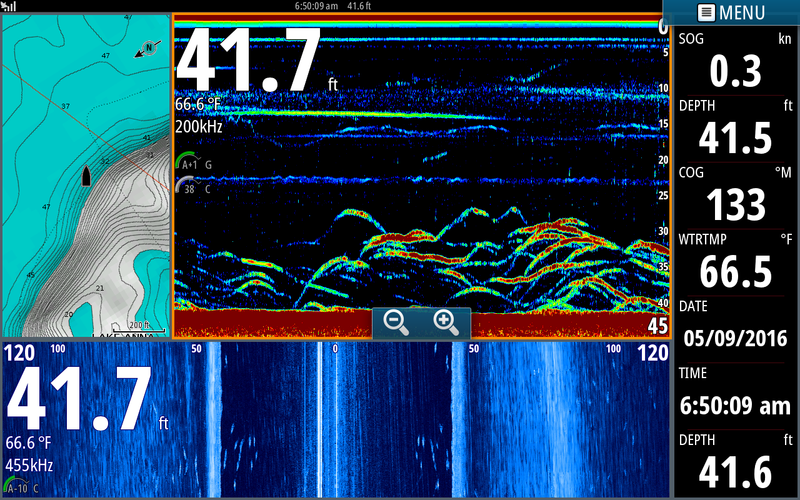 I slowed down on the right third of the screen and watched the Stripers develop into arches. 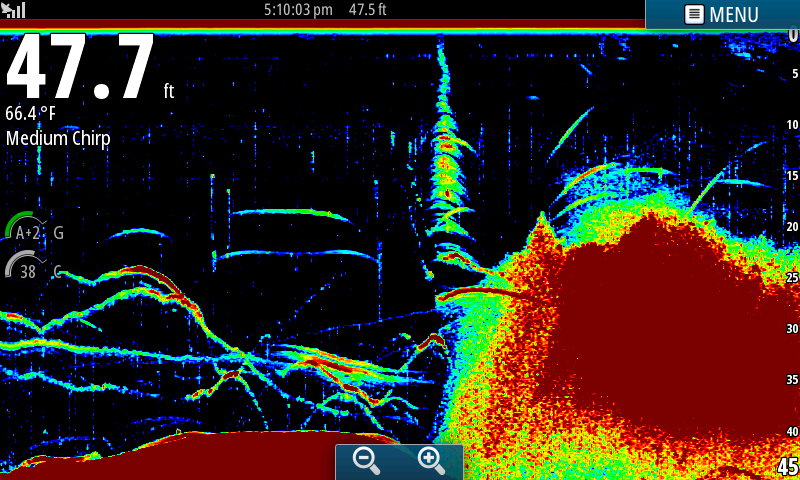 Naturally I turned the boat around , set out downlines and wore them out. Here I am using my Navionics chart in combination with sonar and side scan. You can clearly see the Stripers on the sonar page as well as the white vertical dashes on side scan. 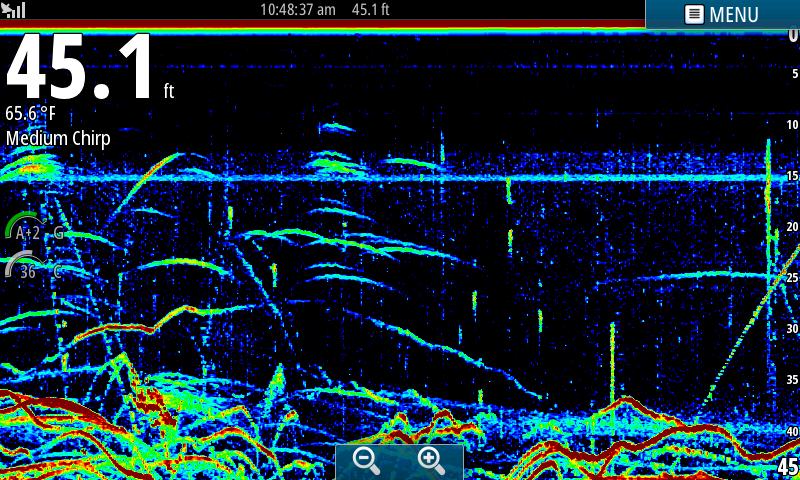 Notice all the way out to 120 feet to the right there are fish. Man we are on um here and can't keep up. you get the results below! 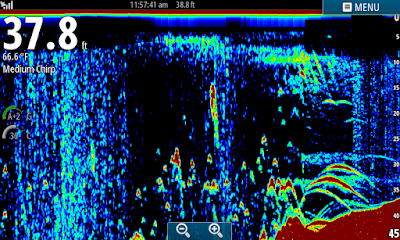 The summer downline bite is beginning to develop which means Lake Anna Striper fishing is about to explode! 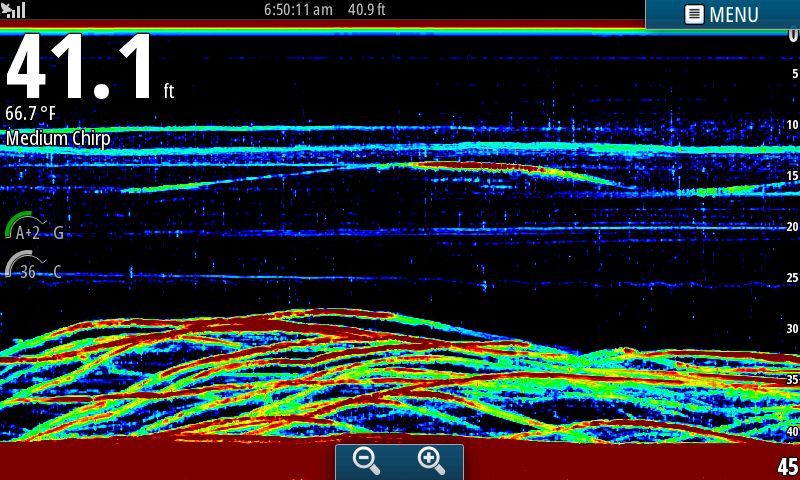 This morning I only had 2 anglers and wore them out by 8am catching over 50 Stripers. It was way too much action for just 2 people to handle. From here on through July I will only be taking parties of a minimum of 4 anglers but 6 would be better. It is not uncommon to catch 100 to 200 fish a morning on this lake and this year is shaping up to be a record breaking year. Two years ago I took the lake biologists out and they caught 270 Stripers by 1pm! If you want to get into some of this action better reserve a trip early to avoid getting shut out. This is a great time to turn children on to catching fish vrs just going fishing, it will prove to be a memory of a lifetime!